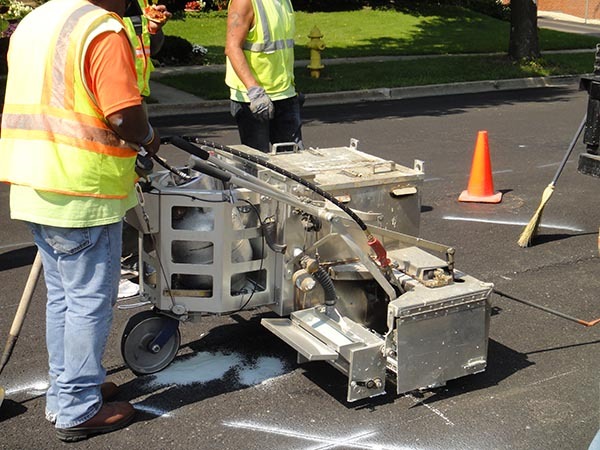 Ever wonder what material is used for parking lot lines and street lines? Today I found out. My boss and I were just talking about it this morning. He wants to do custom lettering for out front parking lot “reserved” and “guest” spaces. During my lunch break I saw a crew putting lines down. I checked in with my boss and he was cool with me spending time to investigate the scene. It’s basically a plastic that’s melted onto the asphalt. It’s called “thermoplastic”. The machine that they operate keeps the plastic melted and also applies it to the surface. There’s a gas tank like the kind you see on gas grills. And they have a compartment where they put crystal materials into so it then mixes with the plastic to make the stuff reflective. So it’s not paint at all! Though acrylic paint is really just liquid plastic that dries. So I supposed thermoplastic can be considered a paint medium. Just a really thick and dense paint material. And yes, the third worker in the background is eating pizza while they’re working. Funny. It’s Evviva Pizza in Wheaton. They’re good if you like lots of cheese. Maybe that’s why he was eating their pizza. The thick gooey cheese reminds him of the thick gooey thermoplastic. There’s another way this thermoplastic can be applied to streets and parking lots. The industry term is preformed thermoplastic. So if you want a big giant letter “B”, then they can cut your graphic out of thermoplastic. Your big letter “B” is placed on the asphalt and then melted into the ground using a heat torch. Some preformed thermoplastics require the material to be pre-heated before applying it to the surface. Others do not. There’s a nice brochure from Ennis Flint detailing preformed thermoplastic. Included are photos showing custom graphics being applied to the road. Why haven’t graffiti artists caught on to preformed thermoplastic? It’s expensive. Grainger sells two 30 foot rolls (6″ width, 90 mil thick) for $259. That’s $4.32 per foot. I’d love to spend a few bucks and get my hands on a couple feet of it. I’m no graffiti artist, but I have other artistic application ideas. There’s also an entire journal dedicated to the topic of thermoplastics, Journal of Thermoplastic Composite Materials. All past issues are available for download for subscribing members. Or you can pay $36 per article. Hey, an industry that charges $4.32 per foot can get away with charging $36 to download an article. A random article example is, “Fabrication and characterization of oil-absorptive fiber by polypropylene and poly(butyl methacrylate-co-hydroxyethyl methacrylate) blends” by Jian Zhao, Changfa Xiao, and Naiku Xu. Oh and as for those bumpy reflectors they put between the lines on highways. I always wondered how they glue those in place. Again, it’s melted thermoplastic.